Nothing is as beautiful as soft, smooth, healthy skin. Unfortunately, our skin is subject to numerous experiences that leave it less than perfect. Time, heredity and gravity all do their part to create fine lines and wrinkles, especially around the mouth and eyes. Continued exposure to the sun and smoking are known to significantly accelerate the development of these natural signs of aging. For a noticeable improvement, we offer skin resurfacing services using the DEKA Smartxide DOT LASER. Some skin resurfacing devices, such as CO2 lasers, use the ablative method: removing the epidermis and some of the dermis. While a good result is eventually seen, the drawbacks include red, raw, and unsightly skin, and a risk of infection for several weeks after treatment. Other devices use the non-ablative method: sending light pulses into the dermis, while leaving the epidermis intact. This allows quick recovery, but when the light pulses don’t penetrate far into the dermis, the change in skin tone and texture is negligible. What makes fractional non-ablative skin resurfacing different? Fractional non-ablative skin resurfacing is the only method which offers both excellent results and less downtime. 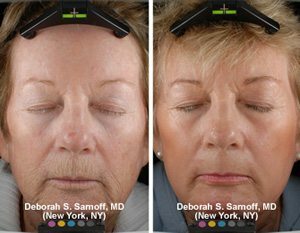 Fractional skin treatments deliver light in an array of narrow, focused “microbeams” to create columns of heat within the skin. These microbeams penetrate deep into the dermis for the most effective, long-term results obtainable. The heated tissue within the columns starts a natural healing process that forms new, healthy tissue. This results in a decrease in sunspots, fine lines, wrinkles, and acne scarring and a fresher, more youthful skin tone and texture. 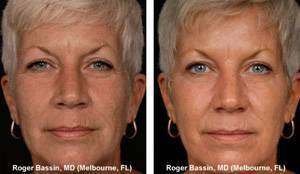 The Fractional Non-ablative approach stimulates quick healing. Fractional non-ablative skin resurfacing can be applied to any area of the body, including the face, chest, arms, legs, and hands. Fractional skin rejuvenation is designed to alter only portions of the targeted skin tissue. Think of the treatment as digital tissue editing. Fractional skin rejuvenation creates multiple, microscopic, thermal columns within the skin. Together these micro-treatments cause a change in the collagen and elastin below your skin’s surface, which gradually improves the appearance of your aging and sun-damaged skin. It also results in a healing process with minimal downtime. In addition, fractional skin rejuvenation penetrates to a very precise, controlled depth, making the procedure safe and predictable, while reducing the risk of scarring or pigmentation problems. Why choose fractional skin rejuvenation? This varies from patient to patient depending on the severity of the condition and the depth of treatment. Some patients prefer to have more aggressive treatment in 1 – 2 treatments and plan their recovery time accordingly. Others prefer to have less downtime and understand that a series of treatments may then be required to achieve their goals. Regardless, patients continue to see benefits from their treatment plan for many months after completion as new collagen is formed. Patients are treated with a topical numbing agent and oral medications as required for comfort an hour before the treatment. Then, the area to be treated is cleansed. The treatment is performed using a fractional hand piece gently guided across your skin delivering micro beams of energy into the skin. Treatments usually last from 30 minutes to an hour depending on the surface area treated. You may experience a stinging sunburn-like sensation and swelling, and will develop a light crust that exfoliates away within days. The crust exfoliates to reveal new, healthier tissue. Redness will persist based on the depth of the treatment that will need to be protected with adequate SPF and wearing a hat while outdoors. Gradually the skin will show signs of diminished sun damage, improved texture, softer wrinkles, even more firmness and elasticity. For more information, photos, and videos about DOT therapy, visit www.dottherapy.com.